If you’re a senior with an appetite for travel, do not allow being in a wheelchair hold you back. As the avid traveler, triple-amputee, and wheelchair user John Morris can attest, there many are ways to satisfy your wanderlust regardless of age or needing a wheelchair. Morris has visited more than 30 countries and territories. Flying with a chairis definitely doable. So, whether you’re traveling to more rugged areas, or some of the most wheelchair-friendly destinations in the U.S. (The Skydeck in Downtown Chicago, Disney Parks, or The National Sports Center for the Disabled) we have you covered on the best electric wheelchairs for travel. We love how easy it is to lift this chair along with some of its other features, such as removable upholstery for cleaning. The Innuovo Electric Power Wheelchairisan extremely lightweight chair for an electric model, and it opens up a range of travel possibilities for active seniors. At only 18 pounds, it’s easy to carry and to lift in and out of vehicles. It can climb on the national standard of a six-degree incline and has high-tread tires to give you enhanced mobility. It’s both airport and airplane safe. Combined with the lightweight, foldable features of this model, its airplane-friendliness makes it one of our favorites for travel. There is also a one-year warranty on the joystick, controller, and motor. The braking is secure, and with only a tiny bit of a sluggish start, it gets moving up to a solid walking pace. 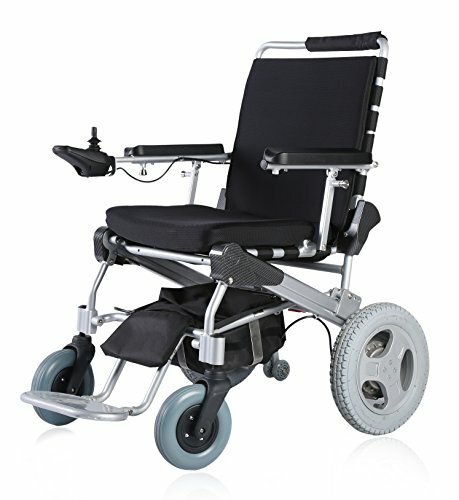 The beauty of this lightweight wheelchair is that is has a higher weight capacity than we often see with standard chairs. This makes it a sturdier option for more individuals, which we love. With almost zero negative ratings, this is our favorite lightweight electric wheelchair. Completely foldable and able to handle 12-degree inclines, this makes an excellent option for travel. Reviewed and approved by The Christopher and Dana Reeve Foundation. Moves up to 3.75 to 4 miles per hour. Incline capability of 12-degree slope. Lower cost than many power wheelchairs. The KD Smart Chair Power Electric Wheelchair is a decent value for a power chair. While many cost over $3,000, this model runs around $2,000 but still works excellently for everyday use. It also folds-up easily for travel and transport in and out of vehicles. What’s more, folding action of this wheelchair is supremely smooth and can be done within a few seconds, thanks in part to folding footrests. Once you get it going, this chair moves at an extremely brisk walking pace—3.75 to 4 miles per hour on polyurethane rubber wheels. We love this chair for everyday use, especially for older adults who are on the go and frequently need to fold up their wheelchair. 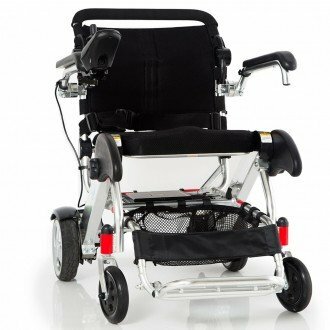 The ease of folding and storing makes this a winner for a travel power wheelchair. With the add-on battery option, this wheelchair can go up to 20 miles on a single charge. Uses a Lithium Ion Battery for 10 miles on a full charge. Add a second battery (sold separately) for 20 miles of range. 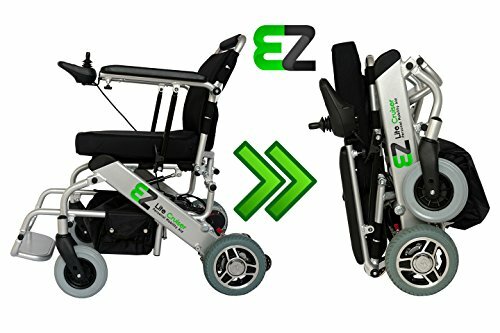 The EZ Lite Cruiser Folding Power Wheel chair is made out of a durable, lightweight aluminum alloy, making it quite light for a power chair at only 44 pounds. The cost of this chair is also a bit lower than some other electric wheelchair options on the market. With a single battery, you can get a solid 10 miles of use on a single charge. However, larger-sized cells are available, and an additional battery can be added on for increased mileage. 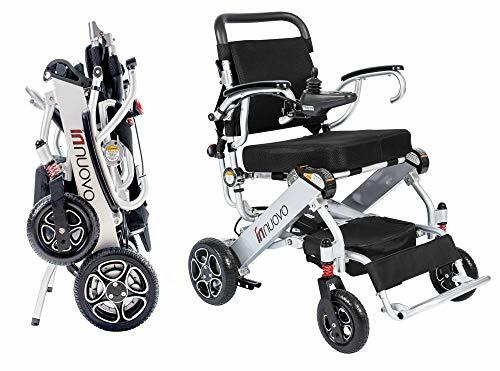 With the foldable design and excellent battery options, this is one of our favorite models for a long-distance and easy-to-travel wheelchair for seniors looking to expand their horizons. We love that this chair has a sturdy frame, yet still folds down and has a reclining backrest. The EZ Lite Cruiser Deluxe DX 12 is our Redesigned Version of the Heavy Duty (HD). Now with the Quickest and Easiest Folding & Unfolding action ever seen. Perfect for Outdoor Usage with Rugged 12" Rear Wheels, and Works Great Indoors as well. Lithium Ion Battery Gets 10+ miles on a single charge. Connect two batteries for 20+ miles range. The EZ Lite Cruiser Deluxe DX12 Foldable Mobility Aid is sturdy, durable, yet foldable, and can even be broken down. With a patent on their Quick Release feature, EZ Lite designed this model to be split into three pieces for even more storage or travel options. We found the folding action to be very easy and quick to use. This model also has a top speed of a rapid five miles per hour, a solid jogging pace that makes it great for older adults who no longer drive but want to get around town. With high tread on the rear wheels, it aids in gripping the ground and giving you a more stable ride. The reclining backrest is a bonus we love, with five positions to make your more comfortable and take pressure off the hips. This wheelchair comes with an easy-use-use portable charger and accessible features that make it a user-friendly favorite. The range of 8.74 miles on single charge. Seat measures 17 x 18 inches. Seat to floor measures 22 inches. Chair measures 36.5 x 24 x 20.5 inches. Weight capacity is 300 pounds. The Pride Go-Chair is surprisingly easy to maneuver in tight places. The charger for this chair is also simple to use and portable, making it ideal for independent seniors. While it might be a little heavier than some chairs, it can be taken apart in only a few minutes, and the most substantial piece is 36 pounds. The ease of operating this model is superb, making it our favorite user-friendly wheelchair. We found the stadium-style seat comfortable. This model also features flip-back armrests that are adjustable in both height and width. This helps you to get in and out of the wheelchair without hassle. There are also two separate storage compartments under the seat. We like this option as it’s a more secure storage area than the exposed back of the chair. Top of the line and tech-friendly—this is our favorite high-end model for its speed, comfort, and Bluetooth connectivity. 2 V 10 AH lithium ion battery. Seat measures 16 x 18 inches. Seat to floor is 19 inches. Overall measures 31 x 38.8 x 23.5 inches. Weight capacity is 250 pounds. The Whill Model Chi is the ultimate high-tech power wheelchair for those who want a high-end model. With Bluetooth connectivity, it allows you to manage your speed settings, to lock and unlock your chair, and access the diagnostics system wherever you are through the Whill Chi iPhone app. There is also a convenient built-in USB port so you can charge on the go. This chair has a small footprint and a tight turning radius. Coupled with precise steering, this makes it user-friendly in tiny spaces. We also like the under-seat storage bin to carry your items securely. This power wheelchair even has electromagnetic brakes for extra-smooth stops, and the armrests move up and out of your way for more straightforward transfers. It can also handle inclines of 10 degrees and maneuvers over obstacles up to two inches high. Some older adults may face a learning curve with such new technology, but we think savvy seniors will enjoy the many luxuries of this chair once they adjust to it. As with any wheelchair, you will want to consider the basics such as the weight of the chair, foldability, sturdiness, and seat size. When it comes to travel and adding in an electric element, there are a few more things to consider. Airlines are required to allow older adults or people with disabilities to access the same travel opportunities as those without disabilities, unless doing so poses a threat to the safety of other passengers. This means airlines must have wheelchair-accessible aircraft doors, an aisle seat, as well as a seat with a removable armrest for chairs. Airplanes with less than 30 seats are, in general, the exception for these regulations. However, planes with more than 60 seats are required to have these specifications as well as a wheelchair on board. If you plan to travel overseas, check into purchasing a power converter, and find out how you will be able to frequently charge the battery of your chair. You will need to check the battery type and make sure you have the proper converter for foreign countries. Will you be driving your wheelchair for extremely long jaunts on your trip? Or will you be lounging poolside at nearby a hotel? If you know you’ll be traveling long distances, check with airline regulations on the size of battery that can go with you. Looking for a chair that is good for mileage or extra batteries might be needed in that case. Travelling can be uncomfortable for anyone. Moreover, things like unstable roads or bumps over unexpected cobblestones can become more painful while in a wheelchair that doesn’t have the right accommodations. But with the right chair and a little planning, your comfort doesn’t need to be compromised. We suggest adding any comforts to your chair that you can, such as an extra cushion for the seat and even for the backrest. Elevating leg rests can also be crucial if you’re planning to be on long flights to help with circulation while in the air. Taking trips with an electric wheelchair can add an extra headache if you don’t plan ahead. It only requires a little research and a bit of planning to figure out how to see the world with your power chair. Having a small repair kit (that can pass through security) to fix any potential small damage to your wheelchair is an excellent idea. It’s also smart to have insurance on your chair. Also, call ahead to be sure the airline, train, or cruise ship knows the measurements of your wheelchair and can be prepared if you’ll need additional accommodations. Your budget will have to be a factor in your decision of a power chair, of course. Electric wheelchairs cost significantly more than manual wheelchairs. However, they can also provide an added level of ease and comfort you won’t always find in a manual model. If you have the means for it, we love the Whill Model Chi electric wheelchair. However, any of these are outstanding options for older adults who want to get out and see the world.